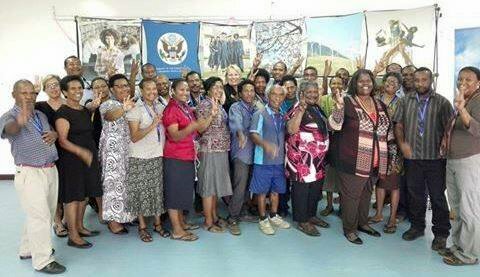 U.S. Embassy Port Moresby celebrates the 3rd anniversary of the opening of the American Corner at the Papua New Guinea National Library and Archives on September 23. This special occasion has been hailed all week with reading events, environmental films, a presentation by Kasek Galgal (a UPNG physics tutor and hip-hop performer), and a thank you breakfast for the staff of the National Library. The American Corner exemplifies the U.S. commitment to a core tenet of democracy: the citizen’s right to free access to information. In addition to the collection of books and periodicals, computers and internet access are available free of charge to the public. Research tools through eLibraryUSA, English language programming, educational advising, cultural programs, alumni activities and information about the United States are also available at the American Corner. The American Corner is located inside the Papua New Guinea National Library and Archives in Waigani. It is open to the public Monday through Friday from 9:00 AM – 4:00 PM and all services are free of charge. Follow us on Facebook at Facebook.com/amcornerpom and Facebook.com/usembassyportmoresby.